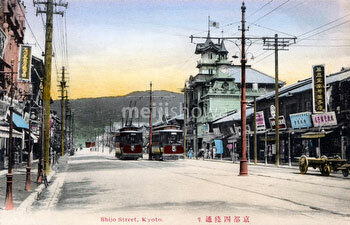 On February 1, 1895 (Meiji 28), Japan’s very first electric streetcar opened operations in Kyoto. The Kyoto Electric Railway Co. Ltd. (京都電気鉄道, Kyoto Denki Tetsudo or Kyoden) started with a 6 kilometer stretch between the Higashinotoin-Shiokoji intersection and Aburagake, Fushimi in Kyoto. 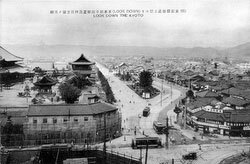 Later other lines were added. 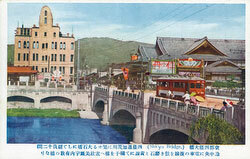 Nicknamed Chin-chin-densha, the streetcars were extremely popular. 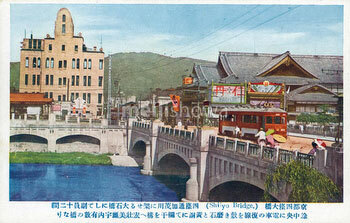 In 1918 (Taisho 7) the company was purchased by Kyoto Shiden (京都市電), run by the municipal government of Kyoto. All the routes of Kyoto Shiden were abolished in 1978 (Showa 53).